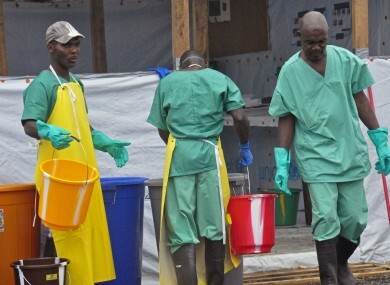 Health workers with buckets, as part of their Ebola virus prevention protective gear, at an Ebola treatment center in the city of Monrovia, Liberia. RESEARCHERS AND GOVERNMENTS must ensure that experimental drugs for Ebola aren’t just given well-connected or well-off patients, according to two leading bioethicists. It follows the successful treatment of two American aid workers who contracted the disease in Liberia. Controversially, the two — Kent Brantly and Nancy Writebol — were treated with the experimental drug, Zmapp. Their treatment has raised debates within medical circles over the ethical use of untested drugs, and the selection of patients for such treatments. The drug had never been used on humans before, and it’s still unclear whether it was responsible for the recoveries of the two American patients. Three doctors in Liberia were given Zmapp last week. It was also administered to a Spanish priest who contracted the disease, but he later died. Writing in medical journal The Lancet, Professor Ezekiel Emanuel, of the University of Pennsylvania and Dr Annette Rid, of King’s College London, said it was vitally important that experimental drugs were provided to patients as part of randomized-controlled trials, in collaboration with local communities and other stakeholders. “Less than less than 10 per cent of candidate drugs make it from pre-clinical selection to commercial launch. Although promising in non-human primates, there is no reason to believe that the experimental Ebola interventions will be more successful. “In other words, it is more likely than not that the interventions will not improve symptoms for patients, and might even weaken them as they battle a life-threatening disease. Experimental Ebola treatments or vaccines should only be deployed in clinical trials, and if trials are done, they must meet ethical principles for research. Ebola victim Dr Kent Brantly (left) after being released from Emory University Hospital, Atlanta, yesterday. The two experts stressed the need for the international community to focus on the strengthening of health systems and infrastructure and less on experimental treatments. The death toll from the current Ebola outbreak has reached 1,350. It is spread through direct contact with the bodily fluids of people experiencing symptoms of the disease. No known vaccine or drug treatment has been proven to fight Ebola. Treatment of the virus involves providing the patient with intravenous fluids and balancing electrolytes as well as providing oxygen, if needed, and treating other infections as they occur. Email “Experimental Ebola drugs shouldn't just be given to well-off patients, say experts”. Feedback on “Experimental Ebola drugs shouldn't just be given to well-off patients, say experts”.